The “World Social Science Forum (WSSF)” took place in Fukuoka City from September 25th through 28th, 2018. This is one of the largest international conferences on social science. The opening ceremony, which was held on September 25th, was attended by Their Imperial Highness Crown Prince Naruhito and Crown Princess Masako. His Imperial Highness Crown Prince Naruhito delivered the opening speech. On September 26th, the session “Protection and Promotion of Heritage and the Diversity of Cultural Expressions to Foster Culture of Belongings in Pacific Small Island Developing States (SIDS) under Globalization and Climate Change” co-chaired by the Department of Intangible Cultural Heritage of Tokyo National Research Institute for Cultural Properties (TNRICP) and the UNESCO Office for the Pacific States took place. Prior to the session, to exchange opinions particularly on the conservation and utilization of canoes as intangible cultural heritage, the Institute invited Mr. Larry RAIGETAL, who has traditional navigation technique and heads up Waa’gey, an NGO working on revival of canoe culture and environmental issues based in Yap State of the Federated States of Micronesia. Mr. Tomo ISHIMURA, from the Department of Intangible Cultural Heritage, TNRICP and Dr. Akatsuki TAKAHASHI from the UNESCO Office for the Pacific States moderated the session. 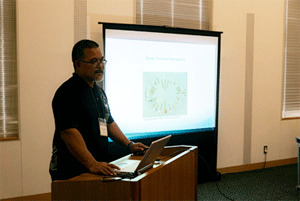 In addition to the presentations by Mr. Raigetal, Ms. Sandy MORRISON (University of Waikato), a researcher on the native tribe in New Zealand (the Maori), and Mr. Yuji KURIHARA (Executive Vice Director of Kyoto National Museum), Dr. Matori YAMAMOTO (Hosei University), the President of the Japanese Society for Oceanic Studies, offered a comment. At the session, an active discussion was held over how to conserve tangible and intangible cultural heritage in the Pacific States and how it should be developed further into the renaissance of culture. 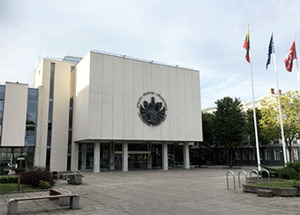 During the presentation, Mr. Raigetal expressed his opinion that the conservation of traditional culture in a sustainable manner under the current circumstances of climatic change and globalization would result in finding a key to solving the problems of modern society while referring to traditional navigation technique for canoes acquired by him, particularly to his knowledge on star navigation. The opinion of Mr. Raigetal, who has wide international knowledge by attending the Conferences of the Parties to the United Nations Framework Convention on Climate Change, was a precious, thought-provoking one. On September 29th after the forum, we were invited to the workshop organized by the Nippon Voyaging Association (Representative: Mr. Tomoki OKU) in Hyuga City, Miyazaki Prefecture. Mr. Raigetal exchanged opinions with the members of the NPO association. 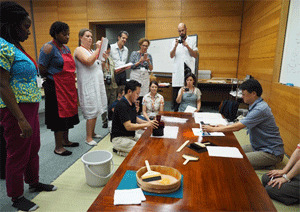 The association has been working on the restoration of traditional navigation canoes donated by the Republic of Palau to Japan and their test navigation, as well as on attempts to revive ancient Japanese navigation technique. 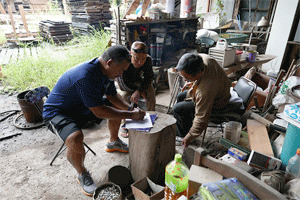 Through the exchange between the association and Mr. Raigetal, the linkage of canoe culture is expected to extend from the Pacific States to Japan, boosting the momentum for interactions between the two regions. TNRICP has been involved in international cooperation for conservation and utilization of canoe culture in the Pacific States by organizing “the First Canoe Summit” at the 12th Festival of Pacific Arts and Culture held in Guam in May 2016. Presently, people in the Pacific States are getting the momentum rolling toward the nomination of canoe culture as intangible cultural heritage by UNESCO. TNRICP hopes that it will contribute further to such a movement as part of its international cooperation. 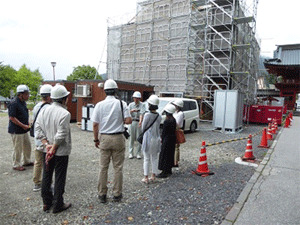 On September 10th, 2018, we visited Chuzen-ji Temple to inspect the “Humidity-controlled warm air treatment ” for its bell tower. This treatment method aims to expel noxious insects harming pillars and beams of wooden structures under a high temperature (around 60°C). Usually, as the temperature increases, wooden building materials crack or strain. However, it is possible to increase the temperature inside the wood almost without affecting its physical property, since the temperature rises while the humidity in the treated space is controlled with the wood water content maintained at a certain level. The conventional yet sole insecticidal method for historical wooden structures is fumigation treatment, where a structure sealed with covering is filled with vaporized pesticide to exterminate noxious insects inside the wood. However, vaporized gas also affects human health, thus, requiring safety measures against greater risks. Accordingly, it was hard to implement such large-scale treatment for wooden structures continually. This Humidity-controlled warm air treatment is expected as a new approach to overcome such a challenge. So far, a research team comprising the Association for the Preservation of the Nikko World Heritage Site Shrines and Temples, Kyoto University, Kyushu National Museum, Total System Laboratory Co., the Japanese Association for Conservation of Architectural Monuments, National Museum of Ethnology, Natural History Museum and Institute, Chiba, and Tokyo National Research Institute for Cultural Properties has been proceeding with the studies from basic research for application to old wooden buildings to establishment of application technique. In the basic research, we verified the humidity distribution in the treated space during the test with a chamber, as well as the temperature distribution inside the wood, measured surface strain, and effects on wooden materials. Then, following the treatment testing with a model structure by using a pilot unit manufactured to control the temperature and humidity of actual structures, we finally realized on-site treatment testing of a historical wooden structure for the second time in Japan after Aizendo Hall of Chuzen-ji Temple. We would like to move ahead with this research toward the dissemination as one of new insecticidal methods while organizing these two treatment test results obtained from two buildings of Chuzen-ji Temple. 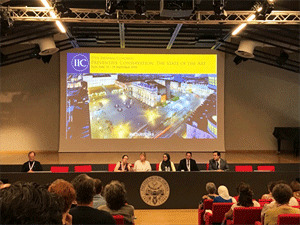 The congress of the International Institute for Conservation of Historic and Artistic Works (IIC) was held from September 10th to 14th in Turin, Italy. From Tokyo National Research Institute for Cultural Properties, Dr. Masahide INUZUKA of the Center for Conservation Science participated in the congress. 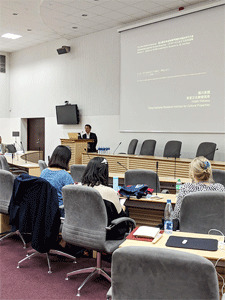 The theme of this congress was “preventive conservation.” Therefore, as well as the specific topics about conservation environments, material analyses and restoration, the importance of preventive conservation, leadership required for experts, public engagement and other relevant subjects were discussed. In the session about preventive conservation for historic sites, Dr. Inuzuka made a presentation on the condensation problems and their preventive measures in a conservation facility for a decorated tumulus in Japan. In the poster sessions, the history of the environmental inspection of museums conducted by the Preventive Conservation Section was reported and information was exchanged with attendants from other countries.